koken rather than zp again. shelf ready for a professional look and feel. php size limit. I’ll let you know what happens after I hit 256. Creative commons options built right in. Have a photo on multiple albums without re upload. No, I haven’t fallen off the face of the earth (if anyone was wondering, which you probably weren’t – but in case you were). I’ve just been busy with life and everything that comes along with. That said, my project of redesigning the site has not completely left me. So here I am – long after the last, to continue on! So now our index.php has a couple of ads on it. Make sure to also edit the album.php, image.php and search.php. At this point, my goal is to just get my ads on the page as well as my analytics code. Lets go ahead and toss that in too between the opening & closing head tag. Once I get these in line, I will focus in on the actual css to restyle the page – but for now I’m just trying to get some of my usually-forgotten basics in. It’s almost overwhelming to think about the gallery page as a whole right now. No new pictures have been added, most of them still need edited through the zenphoto admin control panel (description, name, tags, etc). So much to do, so little time. Now I gotta go the the grocery store, so I’ll shoot another update at a later time. Sorry for the seemingly dragging of my feet – it’s not intentional! Side note: this is not exactly where I wanted to end, but this is the progress I’ve made in the last half hour. Busy, busy, busy! I know it doesn’t look like much (and it really isn’t), but it did -help- to reflect light back onto my objects and cast slightly less harsh shadows. I still had to run the bulk of the pictures through a photo editing program like photoshop or gimp to clean up the ‘white’ background. 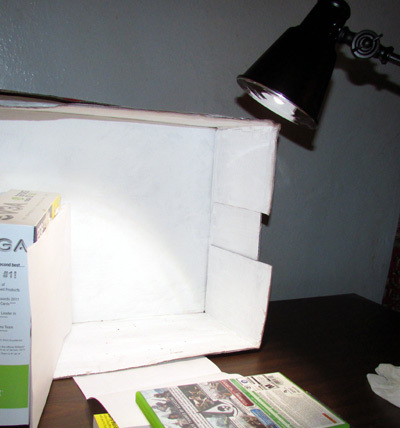 It was an old box that I spray painted white and then had to go over again with acrylic. For my next box, I will try a larger size and white heavy fabric to line it tight. More lights would also be beneficial. Here’s an image taken earlier today of wild grass (maybe?) in front of fall foliage. For me, I was able to stand about 15 or 20 feet back and zoom way (optical at 30x) in to try and get a focus on the seed heads while blurring some of the background and foreground.